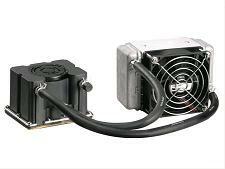 Today’s water cooling kits to cool your processor has several factors one must consider before purchasing a system. First, the cost of the system, the average system an intense gamer would consider would be in the ballpark of $300 to $500. The next factor is the skill or handiness of the person who installing the kit. If one of the hoses is not clamped down tight enough to prevent leaks, the lost of the entire gaming system is at risk. The quality of the parts used will have to be considered. The use of standard piping purchased from your local hardware store may need to be replaced due to exterior becoming dried and cracked and eventually leaking. 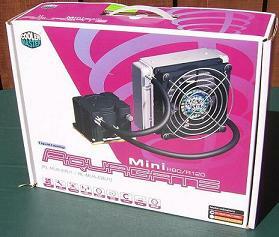 The team at Cooler Master has sent TWL the entry level water cooling system called “Mini Aquagate” (RL-MUA-E8U1 (R80)). This preassembled kit is for the gamer who is looking to water cooler their processor w/o the high cost of your present market water cooling systems. The kit comes will everything you need to mount the kit into your average system and start gaming right away. The kit is so simple to install that an average PC user who assembled their own machine or ever replaced a CPU heat sink can handle.